I've been gone from the blog since December, but now I'm ready to get back to it. A week ago, I started the Autoimmune Paleo diet, at the request of my new functional medicine doctor. I'd been thinking of trying it for a long time, but had been dragging my feet about jumping all in. My doctor's orders coincided with receiving a copy of The Autoimmune Paleo Cookbook in the mail, generous courtesy of the author, Micky Trescott, (review soon to come!) so it was the perfect timing to start. I was kind of surprised by how intense my withdrawal symptoms were for the first two days: headaches, fatigue, ravenous hunger no matter what I ate... Thank goodness that didn't last long. It hasn't been too much of a learning curve adapting to the food restrictions, but I definitely miss my eggs, grass-fed butter, black pepper, mustard, and almond butter! And chocolate, of course. I'm getting the Cyrex Labs Array #4 done soon, so I'll know for sure which foods I cross-react to as if they were gluten. Although you can reverse a lot of food sensitivities by healing your gut, gluten cross-reactivities are a whole other thing, since they happen at the gut level and actually cause leaky gut. You have to avoid those foods since it's a much more serious immune reaction. Anyway, back to cooking. Last night I made a lovely and easy autoimmune paleo compliant entree that was just plain yummy and super easy and, for once, I'm posting it in a timely manner! As per usual, I didn't measure anything, but I doubt you can screw this one up too much. 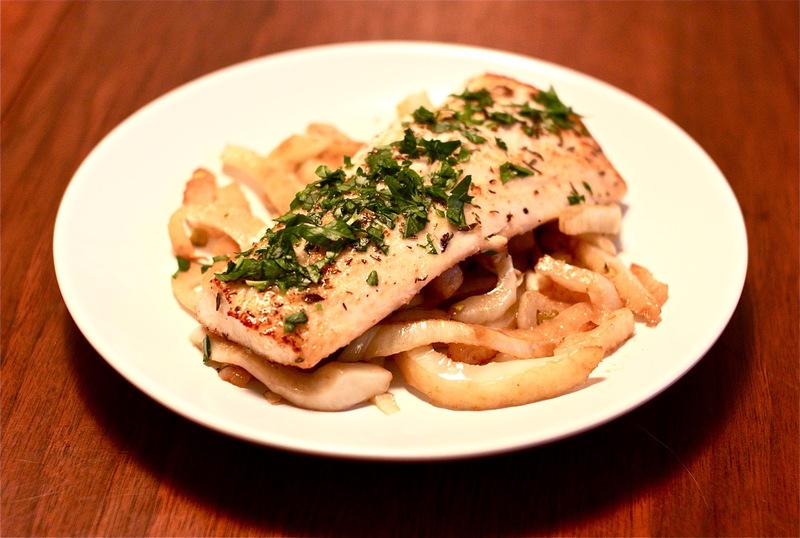 The balsamic fennel adds a gentle sweetness and crunch that pairs nicely with the seasoned mahi. Notes: I cooked the fennel first, as it takes slightly longer than the fish. Slice the fennel bulb into thick slices (as if you were slicing celery). Heat cooking fat on medium and add fennel and sauté until softened. Sprinkle with a little balsamic vinegar to taste at the end of cooking. Set aside. Pat the mahi fillets dry and season generously to taste with the garlic, thyme, and salt. Heat cooking fat in a pan on med-high heat cook the fish until just cooked through (usually just a few minutes on each side). Serve atop the fennel and finish with minced parsley. Sounds good Erin! I'm sure the paleo diet is treating you well. Looking forward to more posts on the diet.